Apply before Apr 22nd to attend the 2nd Open Babble, a hands-on Open Babel workshop presented by Open Babel developers Chris Morley, Tim Vandermeersch and Noel O'Boyle. This will take place on July 5-6 2011 at the Unilever Centre in the Dept of Chemistry, University of Cambridge, UK. 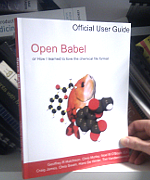 This is the first ever users' workshop for Open Babel, one of the most widely used cheminformatics toolkits. 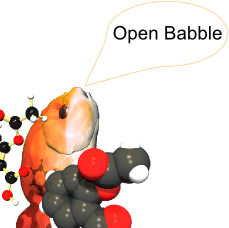 Open Babble presents a unique opportunity to learn how to make the most of Open Babel, whether you are interested in using for converting file formats, writing scripts to analyse molecular structures, or developing your own chemistry software. To apply, see the workshop website. A little while ago, I reviewed Gnuplot in Action by Philipp Janert. One of the aspects of that book that I liked the most was the inclusion of more general discussions about data analysis and appropriate methods. Now Philipp has published a book where those discussions are the focus, and the software is mentioned in passing. Data Analysis with Open Source Tools was published in January 2011 by O'Reilly. To read the full review, head on over to J. Cheminf. 2011, 3:10. I've put together a tutorial to show how to setup, run and analyse basic QM calculations using Avogadro, GAMESS and wxMacMolPlt (respectively). It is aimed at complete beginners to QM calculations (although with a basic knowledge of the theory). Contributions to additional tutorials or suggestions for improvement are most welcome. I recently presented an AutoDock tutorial at the EBI based around PyRx 0.8, an impressive GUI for AutoDock and Vina by Sargis Dallakyan. It worked out very well, and a big thanks to James Watson from the EBI who helped install all the software. While PyRx still has a few rough edges, it is an order of magnitude easier to use than the existing AutoDock GUI AutoDockTools (although the latter allows more fine-grained control). We followed the 2010 PyRx tutorial (PyRx2010_rvsnALP_7122010.pdf) available from http://pyrx.scripps.edu/SI/2010/. You will also need the 3D.sdf from that location. You may also want to download sample.tar.gz. (1) Download AutoDock 4.2. When installing, install to "C:\Program Files (x86)\AutoDock" not C:\Windows\system32 as suggested. (2) Download and install PyRx 0.8. This installs to "C:\Program Files (x86)\PyRx". (3) Replace the appropriate file in "C:\Program Files (x86)\PyRx\Lib\site-packages\PyRx" with importWizard.py, dbPlot.py and autodockNavigator.py. (4) Have everyone start PyRx (there should be a shortcut on the desktop, else run PyRx.bat) and under Edit/Preferences set the location of AutoDock to "C:\Program Files (x86)\AutoDock\autodock.exe" (they can just browse to the folder and file), and similarly for AutoGrid. If they did this properly, the "Local" radiobutton in the bottom of the AutoDock Wizard tab should be available. They should choose this during the docking. It should then be possible to work through the tutorial without problems. The tutorial involves docking a single molecule with AutoDock, then running a virtual screen with Vina (I recommend only choosing 5 molecules unless you have lots of time on your hands). Note that pdbqt files, configuration files and such are saved into C:\Users\MyName\.mgltools\PyRx, if you want to have a look. You can delete this folder to reset PyRx. And all of this software should work equally well on Mac and Linux, although I haven't tested this.